Copyright© 2014 ThingsThatWeDo.com. All Rights Reserved. By the time you’ve read this post, you will have heard about azodicarbonamide, that nasty ingredient found in Subway sandwich breads and in plenty of other fast food chain breads (think McDonald’s, Wendy’s, Burger King, Arby’s and then some. Do a quick Google and you’ll see more than what I’ve listed. There’s no point repeating what everyone else has mentioned but let’s just say it’s been used a lot, apparently because it adds all this amazing volume and texture to that kind of bread. Here’s today’s question though: did you think azodicarbonamide was only found in those breads? Did you think it might also be lurking on your grocery store shelf? Take a look at Exhibit A: Robin Hood All Purpose Nutri Flour Blend with Omega-3 and Fibre. Does the Robin Hood All Purpose Nutri Flour Blend with Omega-3 and Fibre look enticing? 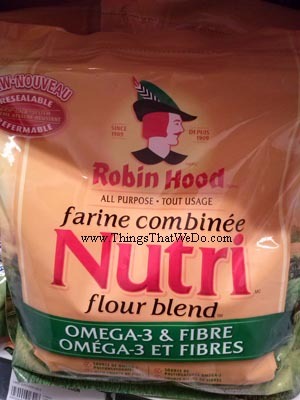 Does the Robin Hood All Purpose Nutri Flour Blend with Omega-3 and Fibre look healthy? Well, let’s just take a look at that ingredient list, shall we? Product Review: What ingredients are in the Robin Hood All Purpose Nutri Flour Blend with Omega-3 and Fibre? Hm…let’s take a wee look at the ingredient section on this bag of Robin Hood All Purpose Nutri Flour Blend with Omega-3 and Fibre: you get whole wheat flour (with amylase, ascorbic acid, azodicarbonamide), and flax seeds. Robin Hood, you put azodicarbonamide into YOUR Robin Hood All Purpose Nutri Flour Blend with Omega-3 and Fibre. Did I just read that correctly? Well, it certainly isn’t a typo. I feel mislead and conned. You see, I picked up that bag of Robin Hood All Purpose Nutri Flour Blend with Omega-3 and Fibre to look at it because it mentioned it had the whole omega-3 and fibre thing happening which technically are supposed to be healthy aspects of food. UNTIL YOU ADD IN THE AZODICARBONAMIDE!! You know, I don’t own a big fancy company so I don’t know why decisions are made the way they are. What I do know is that if I had a company, I’d rather have a smaller profit so I could sleep peacefully at night knowing that I wasn’t using odd ingredients or chemicals in my products. Baked goods don’t have to have ‘THAT’ kind of texture. Our human taste buds get accustomed to whatever we throw at them. Eat enough garbage and you’ll expect your baked goods to taste like ‘THAT’. I am appalled and disgusted and sadly, I’m sure Robin Hood isn’t the only offender. The minute I learned about azodicarbonamide, I told my family and informed my daughter. She understood and although she likes the occasional sub from Subway, she is okay knowing that we won’t be going any time soon because quite frankly, even though they may be removing it from their breads, I’ve lost faith in the company. When a consumer loses faith in you, good luck trying to get it back. p.s. Folks at Robin Hood – I hope you’re listening because I also don’t plan on buying any Robin Hood products any time soon. Yes, I’ve written off your entire line. Call it drastic but that’s how my consumer brain works and I bet mine isn’t the only one. You see, I visited your website and noticed you didn’t even bother including the list of ingredients for the Robin Hood All Purpose Nutri Flour Blend with Omega-3 and Fibre. Sure, lots of products don’t list their ingredients online but many do. When you factor the whole A word situation, I’m even more skeptical. Reminder: this post was written by and for thingsthatwedo.com only. If you see this post anywhere else except on my site at thingsthatwedo.com, know that I have not consented to having any part of this post (or this website for that matter), to be re-produced, copied, or re-printed anywhere else. Practice ethical posting! Like this post by thingsthatwedo.com? Let others know: Tweet it!